Hospitality Lawyer Insights from MTM: #2. When does the hotel industry recover? Hospitality Lawyer Insights from Meet the Money® 2009: The hospitality lawyers of JMBM’s Global Hospitality Group® have presented an annual hotel conference for 19 years. On May 5-7, 2009 in Los Angeles, California, nearly 400 industry leaders gathered at the Sheraton LAX for Meet the Money® 2009. The PowerPoint presentations from a number of industry leaders at Meet the Money® 2009 are listed with hyperlinks at JEWELS from Meet the Money® 2009 — the “best ever” hotel conference. Commentary and observations from the hospitality lawyers of JMBM and other industry experts on some of the critical industry issues are available at Hospitality Lawyer Insights. Here is the latest in the Hospitality Lawyer Insights series on some of the most critical issues of our day. Here are the insights provided by hotel industry leaders at Meet the Money® 2009 on the issue of “recovery”. “We look for a serious recovery in 2011. Then the question is how long will it take to get back to where we were. Michael Cahill is a co-chairman of the Lodging Industry Investment Council (LIIC) as is Jim Butler, Chairman of JMBM’s Global Hospitality Group®. LIIC serves as the leading industry think tank servicing the hospitality business. All together, the members of LIIC represent acquisition and disposition control of billions of dollars in lodging real estate. The hospitality industry’s most influential investors, lenders, corporate real estate executives, REIT’s, public hotel companies, brokers and significant lodging equity sources are represented on the council. LIIC’s recent survey of members indicates the majority believe that lodging real estate investment will get worse before it gets better. The recession will last up to 18 months or more and hotel values will continue to decline. Richard thinks that housing is the ballgame right now. 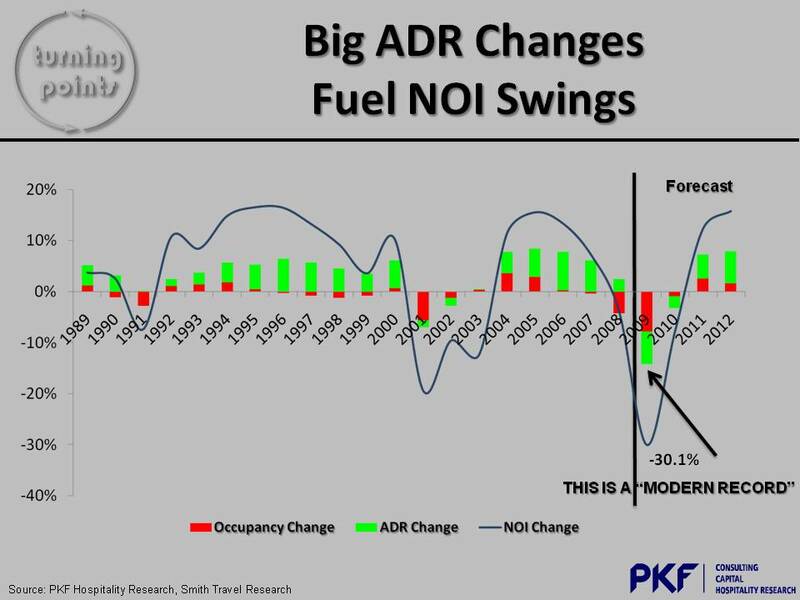 Going back to WW II, there has been no better leading indicator than housing. This last 6 months has been the worst housing market since WW II. Housing defaults are still not at Great Depression levels yet (10%) but we are getting there. Our 90-day delinquency rate is about 7%. There is a lot of stress on households. Contributing to the stress is household debt to GDP, which was 40% after WWI, going up to 60% in 1980. This was acceptable because rent was just another household expense. But after 1980, household debt to GDP has skyrocketed and is now over 100%. So we will not see the consumer driving the economy any time soon. Beware of false bottoms! Things are still getting worse in the economy. This is not the bottom. There are more shoes to drop. RevPAR declines are severe. They have not bottomed and the hotel industry has not bottomed yet, either. In fact, we have not stopped the accelerated decline. The 3-month moving average will go down for April. Maybe it won’t go down quite as much in May, but it will still be bad. And there is more. 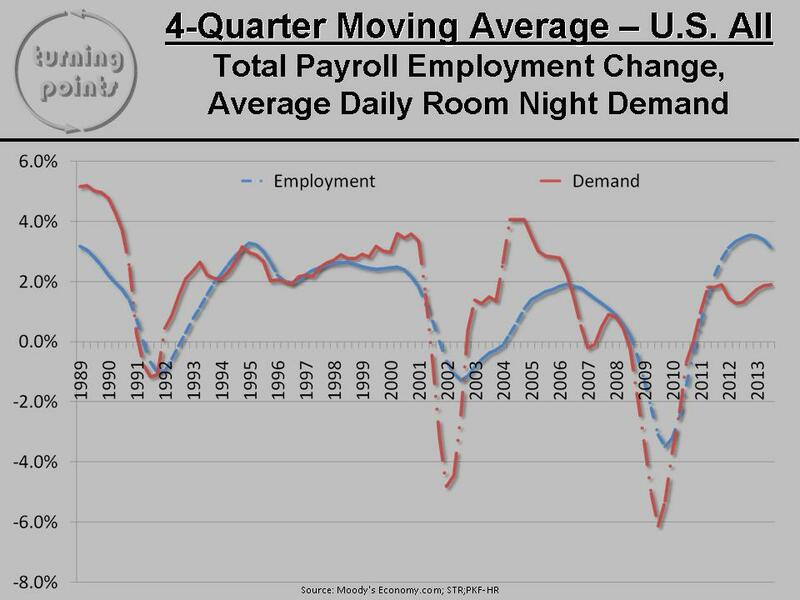 The continuing increased supply problem is not over, but the worsening demand issue is debilitating. This chart so shows the PKF projections on where we are in the hotel cycle of emotions and opportunity. 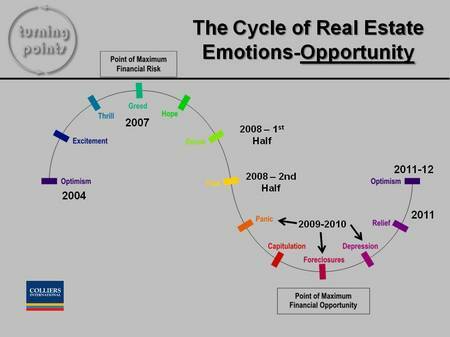 We are in a period of capitulation foreclosures and depression that will last through 2010, with relief beginning to appear in 2011, and optimism coming only in 2011 or 2012. This slide emphasizes that the time of greatest financial opportunity is in 2009 and 2010! 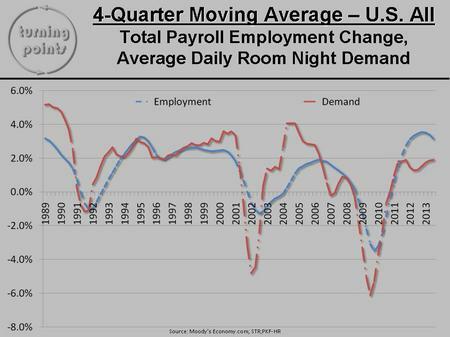 As measured by a 4-quarter moving average, employment and hotel room demand do not start positive growth until 2011. 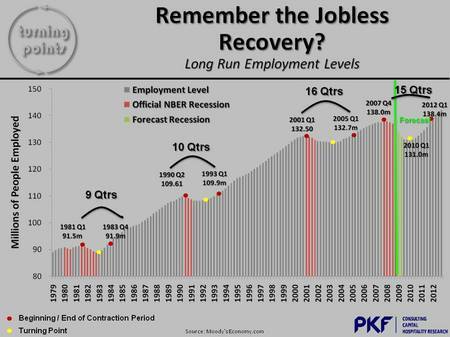 PKF projects that the employment levels affected by current recession will not return to pre-recession levels of Q4 2007 for 15 quarters. 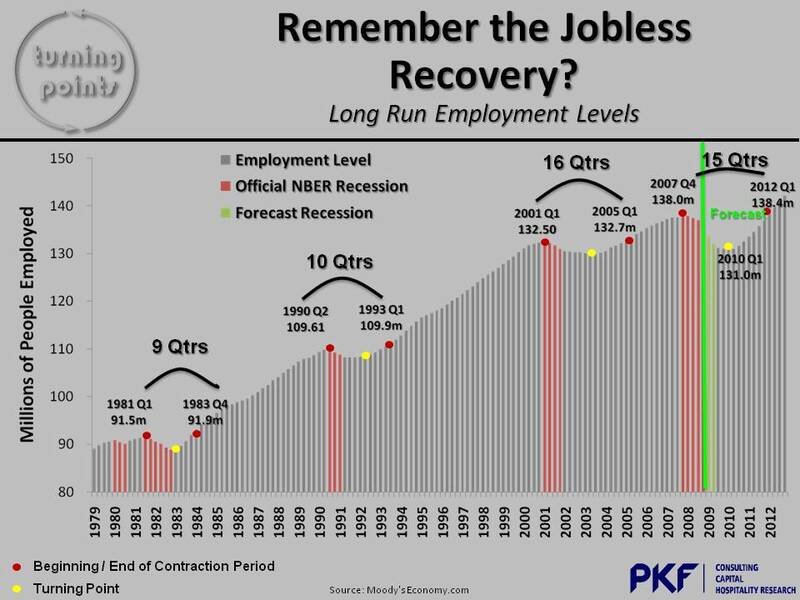 They will not return to pre-recession levels until Q1 of 2012. We are not projected to hit the bottom of employment levels until Q1 of 2010, when employment levels will have decreased by more than 7 million jobs. Many more jobs will be lost before they turn around, roughly a year from now in April 2010, when unemployment peaks at 9.8%. Mark calculates that with all three of these depressing conditions, GDP declines are 2 to 3 times greater. When do we get out of this mess? I don’t know. But there is a lot of pain to endure before we get back to what we thought was normal. We do believe that the next 12-18 months represent the greatest buying opportunity in our lifetime, and that it may well be a long time (7 years or more) before we get back to 2007 levels of profitability and value, on an inflation-adjusted basis. We hope it is sooner.